It's 21:15 in Youngstown, USA right now. Lower Niagara River A view of the Lower Niagara River from Youngstown, NY. Lyndonville, New York: Lake Ontario Shore Line, 33.7 miles away. Toronto: Toronto Island Airport (CYTZ), 33.8 miles away. 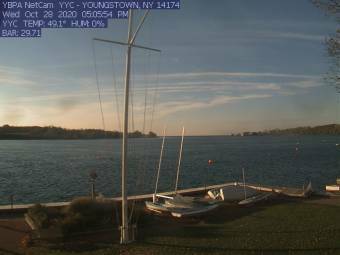 Carlton, New York: WeatherCam Carlton: Lake House, 43.6 miles away. Kent, New York: Oak Orchard Lighthouse, 44 miles away. Oshawa: Oshawa Airport (CYOO), 45.8 miles away.